If you were talking to your doctor, and she said, “Smoking is bad for you”, while lighting a cigarette for herself, would you be confused? Bit of a mixed message, don’t you think? 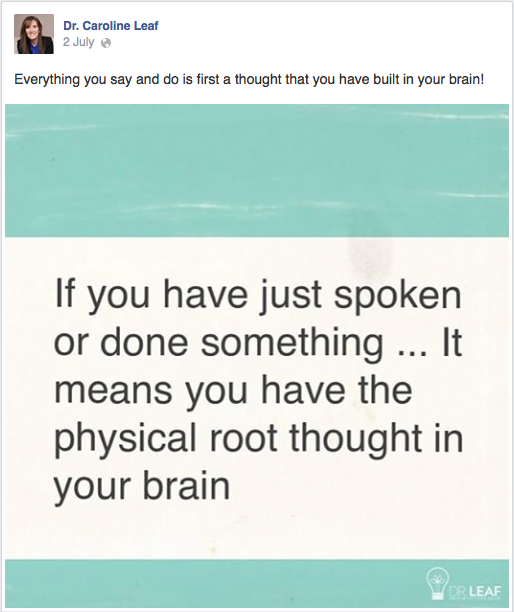 When I got back to Facebook last night, I found this interesting post from Dr Leaf: “If you have just spoken or done something … It means you have the physical root thought in your brain.” Perhaps not interesting in an I-never-knew-that sort of way … more interesting in a yet-another-mixed-message sort of way. Dr Caroline Leaf is a Communication Pathologist and a self-titled Cognitive Neuroscientist. She has a habit of posting fluffy pseudoscientific memes to her social media feeds, which sound plausible at face value, but look a little closer, and they crumble like a sand castle at high tide. Her current post is actually a bit sturdier than usual. We do use information we’ve learned to guide our ultimate behaviour, which include our words and our actions. But that’s not the whole story. Our brain is an amazing organ. It processes a torrent of incoming information, compares it to previous experience stored in memory, and then delivers real-time instructions to the rest of the body, whilst updating the memory systems with the new information received. However, the brain also has a limited amount of energy that it can utilise – the brain only runs on about 40 watts of power [1: p7] (the same as a low power light bulb). In order to use this limited energy efficiently, the brain automates certain actions, like skills or habits, while retaining the flexibility to handle situations or to perform different actions than the skills or habits that we have developed. The brain achieves this feat of brilliance by having a number of different types of memory  – procedural memory, priming, classical conditioning and non-associative learning make up implicit memory (memory not available to conscious awareness). Declarative memory is the fifth type of memory, which has two sub-components: episodic memory, which is the recallable memory of specific events (that you had coffee and eggs for breakfast), which itself is heavily dependent on semantic memory, the recallable memory for concepts (the abstract concepts of coffee, eggs, and breakfast) . The storage of memories within declarative memory is also done piecemeal, by breaking down the information stored into chunks. Byrne notes, “We like to think that memory is similar to taking a photograph and placing that photograph into a filing cabinet drawer to be withdrawn later (recalled) as the ‘memory’ exactly the way it was placed there originally (stored). But memory is more like taking a picture and tearing it up into small pieces and putting the pieces in different drawers. 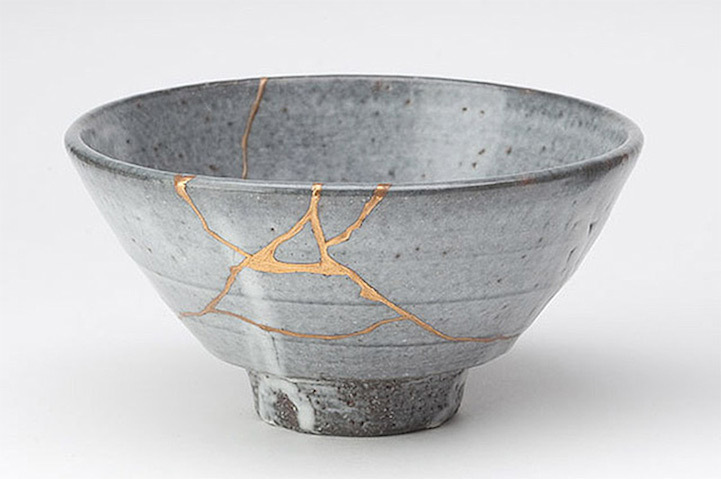 The memory is then recalled by reconstructing the memory from the individual fragments of the memory.”  Retrieving the original memory is an inaccurate process, because sometimes pieces of the memory are lost, faded or mixed up with another . What the memory systems lose in accuracy of recall is more than made up for by the flexibility of the information stored in memory to plan current action, and to imagine possible future scenarios. Each time the brain decides on an action, it subconsciously performs five different steps to determine the best action to take, although the best way to consider the process is simply to say that “voluntary” action is a flexible and intelligent interaction with the subject’s current and historical context (present situation and past experience) . In a new situation, the brain takes the information from the senses (sight, hearing etc) and compares it with the necessary pieces of information recalled from memory, including previous actions taken in similar situations and their outcome. It then decides on the best course of action, plans what to move, when to move, how to move, and then performs one more final check before proceeding. If the situation is familiar, and the brain has a previous script to follow, like a skill or a habit, it will perform those actions preferentially because it’s more efficient in terms of brain energy used, but if there is no previous script, the brain will plan a novel set of actions appropriate to the situation. The best example of this is driving a car. I learnt to drive in my parents’ 1970-something, 4-to-the-floor Chrysler Galant. The skills required to handle a manual transmission car with an old clutch was challenging to learn, but once those skills were mastered and road rules learnt, I could drive successfully. But I didn’t need to learn evasive maneuvers. When confronted with an emergency situation for the first time, my brain moved my body very quickly to control the car in ways I’d not practiced, before my conscious mind had a chance to process the incident. So my brain used skills I had learnt in ways that I had not learnt, independent of my conscious will. Unfortunately for Dr Leaf, cognitive neuroscience disproves her folk-science. It’s way oversimplified to suggest that everything we do is based on our thought life. There are many chunks of our memory that don’t come from a willful, conscious input of information (acquired fear is one example). And the brain can use chunks of memory, often from memory systems not accessible by our conscious awareness, to produce complex actions that are completely new, without needing our conscious input. Even though cognitive neuroscience disproves her meme, which is embarrassing enough for a woman who calls herself a cognitive neuroscientist, the bigger problem for this meme is that Dr Leaf is again contradicting herself. About a month ago, Dr Leaf published on her social media feeds, “Don’t blame your physical brain for your decisions and actions. You control your brain!” Now she says that your words and actions are the result of a hardwired “physical root thought”, so your decisions and actions ARE the result of your physical brain. Which is it Dr Leaf? For the sake of her followers, her clarification would be welcome. After all, the more she contradicts herself, the more doubt she casts over the validity of the rest of her writing and teaching. Is she accurately interpreting research, and drawing valid conclusions? Dr Leaf is welcome to comment. But one thing’s for sure; her mixed message memes are certainly not doing her any favours. Byrne, J.H. Learning and Memory (Section 4, Chapter 7). Neuroscience Online – an electronic textbook for the neurosciences 2013 [cited 2014, Jan 3]; Available from: http://neuroscience.uth.tmc.edu/s4/chapter07.html.